Do you remember me telling you about bathing Katie by myself - in my bathroom? Today on this warm beautiful day, I had help from the boys. Katie did not like it at all. Gracious - I bet you were happy to have help with Katie's bath! Thank you for sharing "Flaunt Your Reds". Your red banner makes me happy every time I visit - your red geraniums are just waiting to be painted. What did Katie do after the bath...like most dogs I bet she rolled in the grass. This way is much easier than the bathtub routine though. HAA HAAAAAA...yes, I DO remember that bath in your bathroom! That was so funny..this time, it looks and sounds much smoother!! Does those boys good to work for their mama. Keeps them in line. I don't know how I'd bathe a big dog like that. I just take mine into the shower with me. Seems like the perfect Memorial Day event. Bet every dog wishes they would smell like watermelon. LOL! Katie is adorable even when she is unhappy about having a bath. LOL...I do remember your bathing her in the bathroom post!! I bet it was much easier with them bathing her outside. We did have some GORGEOUS weather didn't we!?!? How could we forget the story of you bathing Katie in your bathroom. That was so funny!! It looks like things went smoother this time and a dog smelling like watermelon is definitely a good thing. Anytime I've bathed a dog outside, he's immediately found loose dirt to roll in! Instant MUD DOG. I keep them in the house till they are dry, lol. You are a brave woman. Katie must smell delicious. Our Dion hates a bath, when he ends up smelling like coconut. When that shampoo bottle comes out, he's OFF and hiding. What great helpers you have for bathing Katie. You could rent them out! Oh my dog hates baths! I usually get more of a bath than she does. Cute post! I know Katie loved it when it was over. LOL It was so nice out yesterday. By the way, she sure is good to stand there and let them bathe her. Sweet dog. Hope you have a great day today. Love your boy helping to bath the dog. It is easier for me to wrestle the dog than my son to help with the baths. How sweet, Stacey! Our dogs need the same thing and they hate it! There is not an easy way to do it either! Things are busy here...I will be doing one more post before we leave and I will tell everyone about Fridays Flaunt! I really appreciate you doing this!!! It will just be a simple post about me being away for a week or so...I will try to have something RED ready for Friday. Awww...Katie is a cutie pie! Our Bella doesn't like baths, either! About scratches me half to death everytime! Awww! Our Maxie doesn't like getting baths either but he LOVES being blow dryed! Katie is adorable! Poor Katie did not look one bit happy. If the pooches only knew how much we loved them when they were clean! I can't imagine bathing a dog that size; little Chili wears me out and he's only 15 lbs! Too cute!!! We gave up trying to bathe our little Cooper!!! I can't imagine bathing a big dog!!! Ya'll are brave!!! There is nothing like a watermelon smelling dog. Much better! Aren't labs sweet. I used to bath Heidi, our Giant Schnauzer in the bath and it is hard work. Glad that you got some help from the boys. Don't they just smell and look so good after a bath. I just found your blog through 'Tattered Hydrangeas'. I love it. I went to the beginning and read most of it already. I love your page too. Its so pretty. I also love how you decorate. Come visit sometimes and leave a comment if you do so I will know that you stopped by. Nice to meet you. Katie doesn't look one bit happy about her bath but I know she felt (and smelled) better after she dried. Watermellon shampoo-that sounds pretty good to me. Give Katie a hug from me! Bless her heart! I'll bet she smells good! I need to so the same thing with my dogs because they are not smelling watermelonish right now! She is so cute! Thanks for stopping by and leaving the sweet comments. I'm planning on making the smaller shed my craft shed/workshop. It is gonna be like a get-away for me. Like a man has his 'man-cave'. LOL This will be my southern lady cave. lol I'm excited! I have to empty it out first into the bigger shed! I laughed when you said that about being part guestroom! My son wanted me to make him a "Rock band studio" in part of it. What a charming blog. Just stopped by-- day off... good inspiration; needing to get a dog to wash!! How cute is that! My doggies luv their bath. I bet it was fun for the boys, too! I woke up one morning and Milo had something brown all along his side. The worse part was he had not been out since the night before and he slept with us!! Have a great week, Stacey!! HA, what a sweet dog. 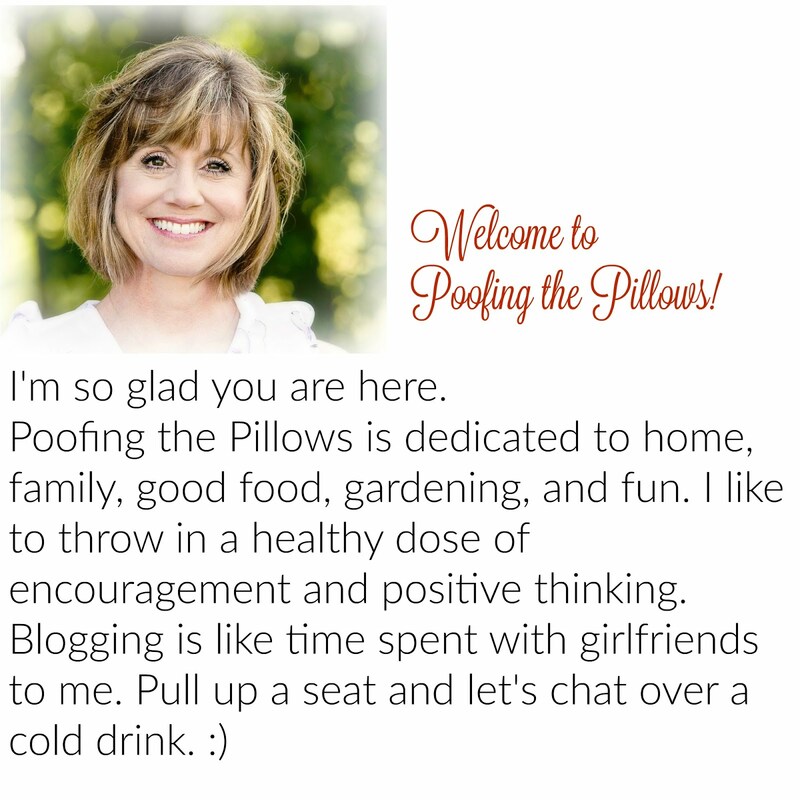 And I love the name of your blog, Poofing the Pillows...adorable!